Want to make Webmail feel more like desktop mail when you’re checking your personal account at work or on a different computer? Sure, you can format messages in rich text and make folders in most services now, but here are a few other tips for managing your mail more efficiently through your Web browser. Gmail. Google’s mail program comes with one level of shortcuts that work automatically and another level that you have to turn on within the Gmail settings. The automatic ones are things like navigational controls for jumping around between messages with the arrow keys, that sort of thing. To turn on the second level of shortcuts, go into your Gmail settings by clicking on the gear-shaped menu icon, selecting Settings and tuning on the option for keyboard shortcuts. Once you save the changes, you get a couple dozen more shortcuts for composing mail, moving through conversations, archiving mail and so forth. Press the keyboard’s ? key to see a list of all the shortcuts. Yahoo. Yahoo has all kinds of shortcuts for using Yahoo Mail, including those for composing messages, working with message lists and navigating. Press the keyboard’s ? key to see a list of all the shortcuts. Outlook.com. In Microsoft’s Webmail service, which used to be Hotmail, you can use the built-in shortcuts, or if you’re coming from Gmail or Yahoo, you can use those instead. When you’re in Outlook.com, Press the keyboard’s ? key to see the shortcuts and get to the settings. 2. Drag and drop those attachments. 3. Use integrated online storage for big attachments. Speaking of the “Share with SkyDrive” option — got a 30-megabyte file that’s too big to attach to a normal message? The big three Webmail service all have integration with other cloud services. 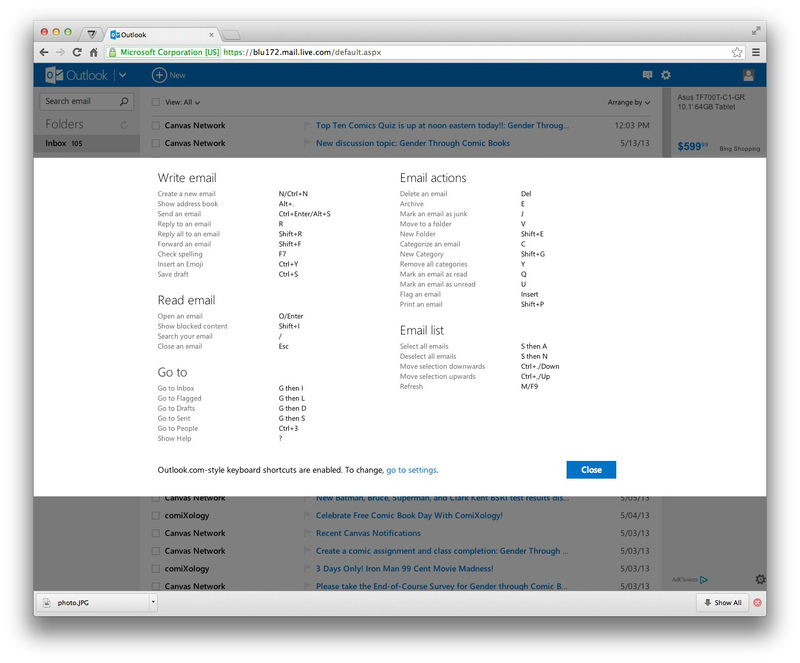 Microsoft’s SkyDrive can do the heavy lifting for mail attachments with Outlook.com and other mail programs. If you have Gmail, you can insert that big attachment that lives on your Google Drive to your Gmail message. Yahoo Mail recently linked up with Dropbox for similar big attachment handing. Some things about doing mail on the Web will always be different than managing your messages with a dedicated desktop program, but Webmail does give you a lot of freedom and perks of its own. And just think how far it’s come since the original HoTMaiL’s official launch back on July 4, 1996, with its free two megabytes of storage. Previous PostEpisode 46 News: Taxing SituationsNext PostEpisode 47: We Had Joy. We Had Fun.